Fèlix Millet sings in a musical about his side of the corruption case around the Palau de la Música. During the good times nobody said a word. In those days of prosperity, the then unquestionable success of neoliberal policies shushed all skeptical voices. Now, however, we’re trudging through tougher times and hundreds of thousands of angry roars echo in the streets of every city. They are angry yet peaceful shouts whose echo can be heard in classrooms, galleries and even in theaters. 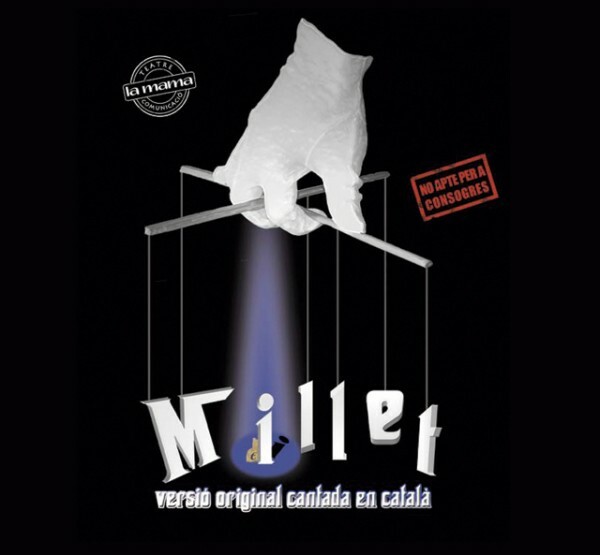 One of those voices can now be seen on stage of Almeria Theatre in Barcelona with Millet, a musical satire about Fèlix Millet directed by Jordi Pérez Solé and Xavier Bonfill. A single actor, Marc Pujol, stars in it playing the most honourable of the corrupt Catalans. Millet calls to the stand the corrupt looter of the Palau de la Música to sing his side of the story. On stage he will sing the story of how he cheated the Catalan society while Catalunya awarded him its highest honours. La Mama, producer of the show, said that what inspired them was the outrage at the corruption, try star of our times, this time in the form of Fèlix Millet. This is an example of a peaceful and witty protest. An ironic echo that is added to the whole choir of people weary of hearing politicians shout at each other while the financial authorities dry up the very rivers from which all those voices must drink.